Why are fanatics so fanatical? 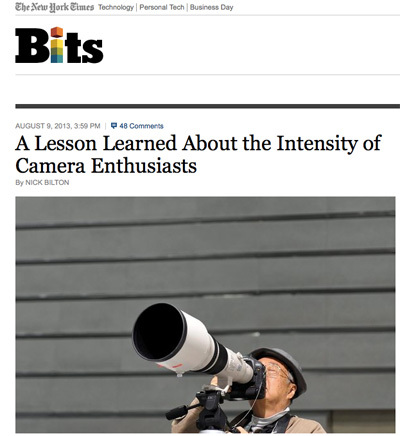 Interested to discover from this New York Times piece just how rabid camera enthusiasts can be when they feel they have been scorned – or just ill-served – by something they’ve read online. I’ve always found it completely bonkers that people can get so worked up about what is a) a hobby, b) a discretionary purchase and c) supposed to be enjoyable. Death threats, suggestions of mental illness or incapacity, allegations of corruption or worse – these are the kind of weapons trotted out by the keyboard warriors in defence of the cause to which they attach themselves. And when none of those work, there are always the old reliables: abuse aimed at others’ age, physical appearance, nationality or sexual preferences – whether real or supposed – all laced with the kind of ‘humour’ I thought had died out when ITV stopped showing The Comedians. Is it the law of the playground, where the weak gain strength by lining up in the shadow of the school bruiser? Or is it just what we do these days now that almost all the pubs have become Sainsburys Locals or Tesco Expresses, and there’s nowhere to go to have a good old-fashioned fun night out of abuse and lovable prejudice? Or maybe it’s the new age of experience by proxy: rather than going out and fighting in the streets, we play role-playing games on the screen, interact with others on the screen, and take out our fury at the injustice of it all by just hammering the keyboard just that bit harder. Come on, these things are meant to be hobbies, meant to be pastimes, meant to be fun. And if you’re convinced everyone in your chosen hobby is wrong/stupid/corrupt, and that we are all victim to vast corporations trying to rip us off with the latest overpriced product, then why not find yourself a new enthusiasm?